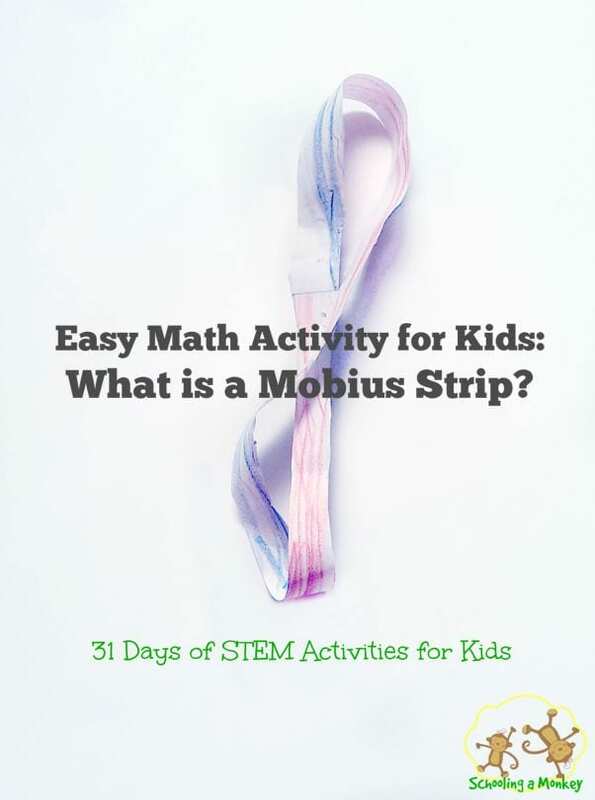 31 Days of STEM Activities for Kids: What is a Mobius Strip? 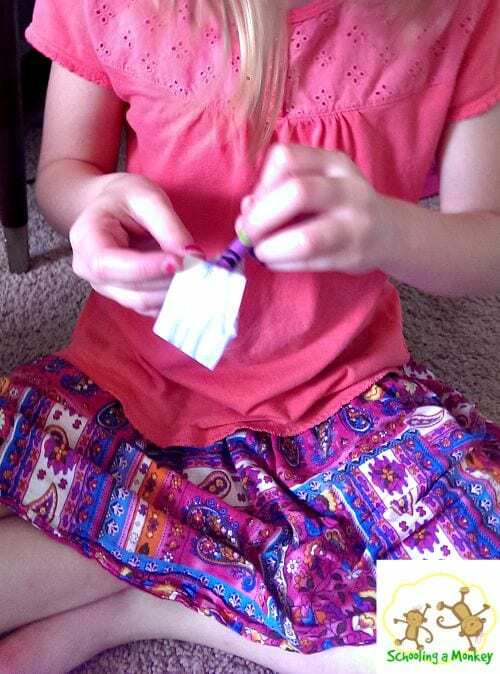 Do you love STEM activities for kids? We do too! 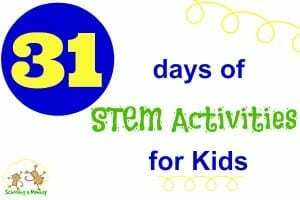 We have an entire 31 day series full of fun STEM activities for kids! I’m going to say straightaway that the math behind the Mobius strip is beyond me. Math is definitely not my strongest suit, and this form of infinite math is quite puzzling. Nevertheless, just because we don’t fully understand something doesn’t mean we can’t share it with others! Monkey found the mobius strip “magic” quite enchanting. She loved that there was an actual math principle behind the trick. The entire strip is a cubic surface even though it is flat. Aside from all of the complicated math, Monkey was quite entertained and puzzled with how the simple strip of paper became an infinite loop. Cut a strip of paper about 1 inch wide and 6 inches long. Color one side blue and one side red (or use whatever colors you have). 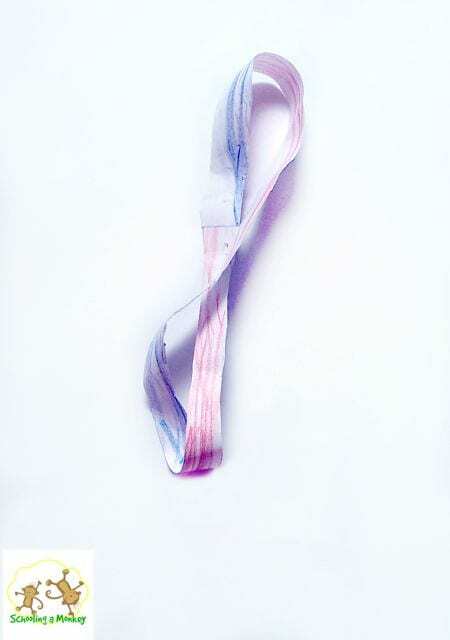 Twist the strip of paper in the center once and tape the two ends of the paper together. You should have a figure eight shape. Have the children trace the path of one of the colors with a third color. Rather than reach the end of the strip, they will start drawing on the second color in an infinite loop. It’s pretty awesome. Take the project a step further by having the children cut the piece of paper in half lengthwise. This will create an even bigger single loop. Monkey loved this step. She liked being able to put the circle over her head. You can learn more about mobius strips here from someone who has a lot more math skills than I have. Don’t forget to check out the other fun math and STEM activities in the complete 31 days series. And if you are looking for some homeschool help, we have you covered right here.